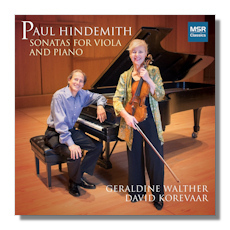 I reviewed a CD of Hindemith works for viola and piano on the Blue Griffin label back in 2013 (Blue Griffin BGR277), and found the music quite worthwhile and the performances very successful. This new MSR issue moves into partial competition with that disc as it contains two of the three sonatas on that CD, plus the Sonata for Viola and Piano, Op. 25, #4. Instead of offering the latter work, the Blue Griffin disc was filled out with the Sonata for Solo Viola (Op. 25 #1) and the brief Capriccio for Cello and Piano (Op. 8 #1), arranged for viola and piano. Both discs are immensely enjoyable and arguably essential for Hindemith's admirers, as well as for viola aficionados in general. It would actually be difficult to make comparisons between the two recordings, however, since the performances feature similar tempo choices and approaches that are not very dissimilar. In addition, both discs offer around fifty-eight minutes' worth of music, but the MSR has some technical advantages: the variations in the second and third movements of Op. 11 #4, are separately tracked, thus yielding a total of ten tracks for the entire sonata compared with three on the Blue Griffin disc. More importantly, the sound reproduction on the MSR disc is somewhat better, especially for the piano, which has a slightly glassy sound on the Blue Griffin CD. The violist and pianist on the MSR disc here are just as impressive in performance as their counterparts, too. The violist, Geraldine Walther, won first prize at the 1979 William Primrose International Competition and served as principal violist with the San Francisco Symphony Orchestra for twenty-nine years. Since 2005 she has been the violist with the highly acclaimed Takacs Quartet. David Korevaar is a veteran pianist whose excellent disc of Hindemith piano sonatas I reviewed here earlier this year (MSR Classics MS1507). In that article I provide some background information on Korevaar as well as on the repertory. Speaking of repertory, I must say that on the whole I prefer the works on the MSR CD, as the aforementioned Sonata for Viola and Piano, Op. 25 #4 (1922) is a wonderfully compelling piece from early in Hindemith's career. It is a three-movement sonata that opens with a long solo passage for the piano, which Korevaar plays with a sense of urgency, the dark music sounding anxious and harried, not overly percussive or harsh. Both the violist and pianist throughout this movement phrase the music with a deft sense for its weird colors and roiling character, the viola sounding weighty and exigent and the piano's legato crisp and lean. The players capture the gloom and doom of the ensuing movement with the same incisiveness, the viola singing mournfully and so beautifully. The finale is riveting: the violist actually sounds suave in the anxiety and drive here, while the pianist imparts an exotic sort of color to the music's fabric, never allowing the blunt forte chords to sound harsh but to serve to propel the music toward its anxious and ambivalent ending. The two play the other sonatas just as convincingly. There are of course other recordings of these works, but they are few and far between, with only the Op. 11 #4 drawing a decent amount of attention and usually on discs with mixed repertory. Let's face it, all-Hindemith viola sonata recordings are something of a rarity. In the end then, this new MSR Classics disc is certainly worth your attention if either Hindemith or viola music is in your area of interests. The sound reproduction, as suggested above, is excellent and the album notes on the music by David Korevaar are enlightening.